April 11, 2019 is National Pet Day! Millions of families across the country own dogs. They are often coming up with ways to make them happier on the inside and outside of their homes. Since dogs often spend a lot of time outside, it is important to have a landscape design that is safe for them but also keeps your yard looking neat. For National Pet Day we will talk about 5 dog friendly landscape tips. 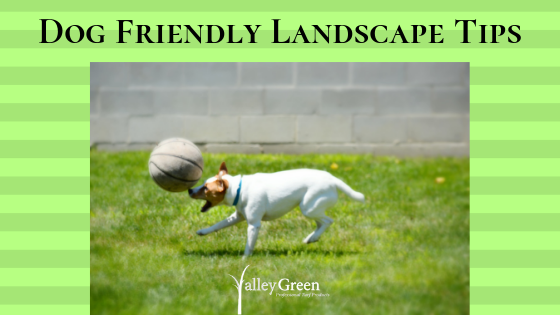 One of the most important things to remember when doing some dog friendly landscaping is to plant a tough type of grass that is resistant to urine stains and digging. You will also want a grass that will not make dogs sick if they consume it. Clover, Buffalo, and Kentucky Bluegrass are all excellent choices. If your dog has worn down the grass in certain paths it walks, consider laying down a layer of pet safe mulch. Avoid cocoa mulches as these are toxic to dogs. Some dogs love to dig. This is fun for them but it can wreak havoc on lawn health. A great way to keep your pup and self happy is to invest in a sandbox. Encourage the dog to dig in the sandbox and offer a treat each time he digs in there. A great enrichment exercise for dogs is to bury the treats in the sand so the dog has to sniff them out and dig them up. Adding fencing can serve 2 purposes. It can keep your dog from running away and keep the dog away from the plants and garden you don’t want them getting into. You can have the fences installed by a professional or do it yourself with some bird netting from your local hardware store. Just make sure the fence is high enough to keep the dog from jumping over it. Make sure your dog has adequate shade to lay under when the weather gets hot and sunny. Plant some trees and bushes. While waiting for them to grow, consider building a canopy or trellis as a temporary place to lounge.